30-Sheet outdoor advertising poster is the standard size static, vinyl, or digital billboard poster format, typically measuring 12’3" x 24’6". An 8-sheet outdoor advertising poster is the standard sized static, vinyl or digital billboard poster format, typically measuring 6’ x 12’. Above the Fold originally a newspaper term, "above the fold" now refers to the portions of a webpage that are visible to visitors without scrolling.The content and ads that are "above the fold" can vary from screen to screen. Typically, publishers refer to "above the fold" inventory or ad space as more premium and will charge a higher rate for it. Accepted formats are billboard ad types that Fliphound or a billboard operator like Atomic Billboards accepts from a buyer. These may include image ads, png or jpeg flash ads, etc. This should help you determine whether or not to purchase available inventory from this media or billboard owner. Ad completion occurs when an ad plays through to the end. For example, one ad may play for 6-8 seconds on a digital billboard or sign and then be repeated multiple times during the day depending on the frequency the advertiser has contracted. An ad exchange is an online marketplace for advertisers to buy and sell inventory, often through real-time auctions. Fliphound went live in May of 2013 with its public and open out-of- home (OOH) digital outdoor advertising exchange and ad platform and remains a leader in OOH industry. Top players on the internet include Google’s AdX, Yahoo’s Right Media, Facebook Exchange and AppNexus. Ad fraud is a type of scam in which the perpetrator fools advertisers into paying for something that is worthless to them, such as fake traffic, fake leads or misrepresented and ineffective ad placement. For example, a website can use bots to automatically refresh its pages that no one will actually see in order to register a high number of page views, drive revenue and appear more attractive as an inventory source on ad exchanges. This is common for internet advertising, since many ad industry leaders believe more than half (50%) of online ads are consumed by bots rather than by real people and living human beings. Ad fraud using bots does not happen in out-of-home (OOH) and the outdoor billboard advertising industry. A metric that refers to the number of times an ad is sent by an ad server to a user's browser. The number of monthly impressions helps a buyer gain more information about a site, its visitors and its popularity. An ad work is a network of advertising sites or ad inventory that can be owned or managed by a media owner or a third party provider and is made available to advertisers, The key function of an ad network is aggregation of ad inventory and supply from media owners and matching it with advertiser demand. In out-of-home (OOH) advertising a network can be as simple as a collection of static or digital billboards from one billboard company or it may consist of a billboard network assembled from group of independent billboard owners that is made available to advertisers. Fliphound, for example, has built an ad network that aggregates hundreds of digital and LED billboards from leading independent billboard owners to create the largest public and open digital billboard network making it easier for advertisers to access and utilize outdoor advertising. On the web an ad network is a company that connects websites with advertising to sell, then aggregates that inventory for advertisers to buy, usually via programmatic exchanges. Ad retention is the percentage of consumers who recall a specific advertisement or brand even after exposure to the advertising has ceased. Advertisements thus have a residual ‘half-life’. In outdoor advertising, ad retention is a measurement of the number of consumers who remember seeing an ad or a brand being advertised on an out-of-home display. A recent study by Nielsen, demonstrates the power of outdoor advertising and digital billboards in connecting with today’s busy consumers. A total of 75 percent of respondents recalled seeing a digital billboard in the past month and 60 percent noticed one in the past week, according to the survey of those who traveled roadways with digital billboards. The study showed brand recall is high among travelers who notice digital billboards. Nielsen tested six different campaigns in five major US markets (Atlanta, Cincinnati, Minneapolis, Phoenix, and Tampa) and found that travelers recalled seeing at least one specific digital billboard ad from 74 to 89 percent of time. Top performing brand categories included entertainment, gaming, quick-service restaurants, recreation, and televised sporting events. Click for Nielsen study. An ad server is the technology that stores, delivers and places ads on websites. Typically, publishers and third-party ad tech companies have ad servers. Fliphound is a top player in the outdoor industry. Top players in the internet industry are Google’s DoubleClick for Publishers, Facebook’s Atlas, Sizmek. Ad servicing is the process an ad server uses to deliver ads to a billboard controller, computer or mobile device. From there, the ad is displayed by on the digital board face or in the case of the internet to the browser. Ad size is the height and width of a display ad. There are more than a dozen ad sizes running on out-of-home signs and billboards - the most common and popular dimensions are measured in pixels and are 1800 w x 500 h and 1500 w x 500 h. For example, a large format 14’ h x 48’ w outdoor billboard bulletins typically requires 1800x500 pixel @96dpi in RGB and JPEG image. Larger ad sizes are recommended, because these ads are more viewable, perform better, more likely to be seen, and have higher recall rates. Ad tag is software code that a buyer provides to an ad network, which will call the advertiser's ad server and then display an ad when called. Ad tech, short for advertising technology, refers commonly to all technologies, media formats, software and services used for delivering, controlling and targeting enabling online advertising. Fliphound is a leading ad tech platform for out-of-home advertising. A custom market (often a group of counties) defined by an advertiser or retailer. The market definition is typically based on sales or other marketing criteria relevant to the product. See Custom Market. An agency trading desk (ATD) is a massive media buyer and re-seller, which functions as an independent working unit within a large media buying concern, that special in programmatic media and audience buying. They are typically layered on top of a Demand-Side Platform (DSP) or other audience buying technologies to manage and optimize ad campaigns. Trading desks attempt to help clients improve their advertising performance and receive increased value from their display advertising. Trading desk staff plan, buy, measure and report media results to clients. All the major holding companies have agency trading desks, top players include Omnicom’s Accuen, WPP’s Xaxis, Publicis Groupe’s Vivaki, Interpublic Group’s Cadreon. Trading desks were created in order to give the client and the agency more control over ad placement. When working with an ad network, the client often has limited say over where the ad is placed. Working with a trading desk allows the client to direct where ad dollars and spent and more closely examine the results to optimize if necessary. Recently agency trading desks are starting to include digital billboards, OOH, DOOH, and outdoor advertising inventory in their media inventory and offerings. Allotment is number of units required to achieve a desired GRP level in a market. Traditional poster panel showings consist of a quantity of displays that will vary by the size of the audience and the size of the market population. Alternative media includes outdoor formats that do not fall into the categories of: billboards, street furniture or transit. Alternative Out of Home (OOH) media includes, but is not limited to: arena and stadiums, interior placed based, convenience stores, video networks, health clubs/restaurants/bars, exterior placed based (i.e. airborne, marine, resorts and leisure). Advertisers use alternative media to create customized advertising programs that generally target specific consumer audiences. Annual average daily traffic (AADT) is a measurement representing the total number of vehicles passing a specific highway outdoor billboard location, based on 24 hour counts taken over an entire year. Counts are adjusted to an estimate of annual average daily traffic; taking into account seasonal variance, weekly changes and other factors. AADT’s are input used to develop circulation information. Approach is the distance measured along the line of travel from the point where an advertising unit, structure or outdoor billboard first becomes fully readable and visible to the point where the copy is no longer readable. Typically approach reads on outdoor billboard units or displays are from 1500, 1000, and 500 feet. Arteries or arterials are the major secondary streets of a city (not freeways) where speeds are usually lower. Many outdoor advertising units and billboards are installed along arteries or arterial streets and roads. Artwork (also called outdoor advertising creative, copy, or production) is the visual image of an ad, to scale, developed by a graphic designer, that will eventually be posted on a billboard or other outdoor advertising structure. Also see Copy. Auction pricing is the price and advertiser pays after participating in an ad auction. The price the advertiser pays for a billboard ad, impressions or ad placement depends on the outcome of the auction. Auction pricing is determined by several factors including the participants in the auction, out-of-home (OOH) inventory availability and the minimum price per ad or flip. Outdoor billboard and online advertisers on Fliphound participate in ad auctions using the platform’s Real-time-bidding (RTB) feature. Audience buying is directly purchasing audience segments based on data that has been assembled about them, including their demographics, interests, etc. For example, audience buying is widely used in the internet and gives a buyer the ability to target consumers who may be planning a vacation and then place ads on all of the sites they might visit in contrast to just airline, hotel and vacation websites. Audience delivery is the size of an audience that notices Out of Home (OOH) advertising or billboard ads usually measured over one or more weeks. Audience delivery can be represented using several definitions, including: impressions, ratings, and reach & frequency. Audited circulation is the certification of traffic and vehicle circulation. Geopath (formerly the Traffic Audit Bureau or TAB) independently audits records and circulation data of outdoor billboard advertising structures for an annual fee. In many cases, large national buyers and advertisers use these audits to compare billboard advertising to other advertising media. A large number of independent billboards are not audited and use state provided circulation data. For example, the Kansas Department of Transportation (KDOT) collects, analyzes, and reports data on the volume and types of traffic on the state highway system and selected local roads/streets that provides similar audits and is used by local billboard operators like Atomic Billboards. Also many national and regional advertisers also rely on third data providers such as INRIX, Google, and others who are beginning to provide real-time traffic data that can complement or be substituted for audited circulation. Automated guaranteed is a type of programmatic advertising. It refers to the direct sale of reserved ad inventory between a buyer and seller, with automation replacing the manual insertion order (IO) process. This inventory is sometimes categorized as premium, reserved, guaranteed, first-look, direct sold or class-1. Automated guaranteed allows the media owner or publisher to regulate the price of inventory to buyers. It also gives buyers the ability to buy more premium inventory on a direct basis from the media owner or publisher, transparently. Media buyers and sellers can connect and transact in this manner via automated guaranteed marketplaces, such as Fliphound for out-of-home billboard advertising or sites like BuySellAds and Criterio for internet advertising. Also known as programmatic guaranteed, programmatic premium, programmatic direct programmatic reserved. The out-of-home, billboard, or digital display advertising inventory that a media owner has made available through Fliphound or other online programmatic partners, both via guaranteed direct and private marketplaces, which advertisers can now buy online with a few mouse clicks. Awareness (also known as ad recall) is the recalled recognition of an Out of Home (OOH) billboard advertising message by an individual or audience. Ad awareness is influenced by creative copy and the consumer's relationship with the product or category. See also Noticing and Engagement. Backlit describes advertising structures or billboards that have illumination which sends light through the advertisement for higher visibility. Ads must be printed on special translucent surfaces. Banner ads are a form of display advertising that has long been considered one of the most popular forms of digital internet advertising. Behavioral target is a method of audience targeting that uses a range of technologies and techniques to show ads to people and online users based on their web browsing behavior information. While this is common on the internet, the out-of-home (OOH) and outdoor billboard industry has seen limited adoption of these marketing techniques. Bi-directional diagnostics is two-way communication between a billboard or sign display and its controller. Bi-directional diagnostics assist in pre-maintenance, maintenance, and troubleshooting of out-of-home assets. Billboard or Board or Sign are large digital or static format advertising displays intended for viewing from extended distances, generally more than 50 feet. Fliphound's billboard inventory includes Bulletins, Posters, Junior Posters, Spectaculars, and other outdoor billboard sizes. Bleed is the display area which extends beyond the live copy area, often to the edge of the finished size or panel frame. A bot is a software application that runs automated tasks – usually that are both simple and structurally repetitive – over the internet typically at a much higher rate than would be possible for a human alone. Many ad industry leaders believe more than half (50%) of online ads are consumed by bots rather than by real people and living human beings (see Ad Fraud). Out-of-home and billboard advertisements (ads) are not subject to automated clicks from bot traffic and are seen by real people, real motorists, and real audiences. Brand lift is the increase in effectiveness measurements (e.g., message recall) between respondents who did not view the ad and those who did. Below the fold (BTF) is the portion of a webpage, and specifically the ads, that are not visible to the visitor without scrolling. Traditionally, BTF was considered less premium and will typically have lower rates than "above the fold" inventory. Bulletin is the term used to describe an outdoor billboard and is the largest standardized Out of Home (OOH) format commonly measuring 14' x 48' in overall size. Typically sold in rotary packages or as permanent displays. Bulletin copy can be rendered using hand painting techniques, computer production or printing on paper. A bus shelter is a curbside transit structure located at regular stopping points along urban bus routes used for outdoor advertising campaigns. Calibration is the measuring and adjusting both the color and the intensity of individual pixels to ensure image consistency across the entire digital billboard sign or display. A campaign is a single or series of advertising messages that communicate an idea or theme to accomplish a set of objectives and is run on different media formats (print, tv, outdoor billboards (OOH), internet, radio or other media) over an interval of time. Campaign completion occurs when an advertising campaign plays through its end date. For example, a campaign may have a start date of July 1 and an end date of July 31 with July 31 being the campaign completion date. Campaign delivery is the audience delivered by an Out of Home (OOH) advertising schedule, expressed in impressions and/or gross rating points (GRPs). Reach & frequency can also be used. Campaign delivery is most valuable when expressed using the demographic target and market definition of the advertiser. A specified period of time when an advertising campaign contract can be terminated. Most outdoor billboard contracts are non-cancelable. Cardinal directions are the four main points of a compass: north, south, east, and west which are also known by the first letters: N, S, E, and W. These four directions are also known as cardinal points. A cardinal direction can also be referred to by first using the word “due”. For example, the cardinal direction of north can also be referred to as due north. When used in outdoor billboard or out-of-home advertising cardinal direction is the direction the billboard unit faces. Core based statistical area (CBSA) is a U.S. geographic area defined by the Office of Management and Budget (OMB) as a metropolitan area(s) within larger markets (e.g. DMAs) containing a substantial population nucleus that consists of one or more counties (or equivalents) anchored by an urban center of at least 10,000 people plus adjacent counties and adjacent communities that have a high degree of economic and social integration with that core and are socioeconomically tied to the urban center by commuting. CBSA’s are a standard geography for buying and selling outdoor billboard (OOH) advertising, TV, radio, print, internet, and other media. The United States Office of Management and Budget (OMB) has defined 917 core-based statistical areas (CBSAs) for the United States and 12 for Puerto Rico. Center-to-center-spacing is the distance between the center point of one pixel and the center of an adjacent pixel on a video or message center display. Also known as pitch. Character height is the height of the largest letter that can be displayed on a digital billboard or display; a height of a seven-pixel high character according to center-to-center spacing (e.g., 3.0" center-to-center spacing x 7 pixels = 21" character height). For example, a 32 pixel character will be 1 foot tall on an outdoor billboard ad. Billboard charting is the process of selecting and scheduling individual unit locations to maximize Out of Home (OOH) advertising objectives. Charting the Showing, also known as charting the program, is the process of selecting individual unit or billboard structure locations to maximize out-of- home advertising objectives. For example, advertiser objectives may include reaching certain circulation, traffic counts, GRP level or CPM costs. Circulation is a measurement of traffic volume in a market. Circulation estimates the number of people with an opportunity to see or be exposed to an Out of Home (OOH) display or billboard ad within a campaign period based on the traffic volume in a market. Cluster is a grouping of LEDs that act as a single pixel. Code of Industry Principles are a set of voluntary principles, prescribed by the Outdoor Advertising Association of America (OAAA), that pledges a commitment by its members to operate in the public interest. Color accuracy is the conformity or exactness of color match, clarity and accuracy within the individual primary color groups of red, green and blue. Color shift is the angle of viewing off axis where the slightest change in pixel coloration occurs. Color temperature is the degree of hotness or coolness of a color, measured in degrees Kelvin. If a video display is said to have a color temperature of 7,000° Kelvin, for example, the whites have the same shade as a piece of pure carbon heated to that temperature. Low color temperatures have a shift toward red, and high color temperatures have a shift toward blue. The standard white for NTSC in the United States is 6,500° Kelvin. A commercial audience is an estimate of the people, motorists, or the target audience exposed to actual advertising. Advertisers can use this to measure the effectiveness of billboard and outdoor advertising to other forms of media - TV, radio, print and internet that use similar measurements. Continuity is the elimination of gaps in a media schedule by maximizing the duration of a campaign, ideally 52-weeks. Contrast ratio is the ratio between the brightness or intensity measurement taken when the screen is displaying a blank video signal and a full, white video signal. This ratio determines the readability of the display so as to measure "depth" of an image or as a measure of how well the image can be seen in high ambient light. A controller is a computer, PC, or computer-type device used to program, communicate with, manage, and operate billboards or digital displays and is usually placed inside a secure steel or aluminum enclosure or cabinet attached to the structure. A cookie is an identifier attached to a person’s internet browser to track the sites he or she visits. Co-op (cooperative) advertising is a partnership established between the manufacturer and retailer (or agent) to share the cost of advertising at the local level. In the auto industry it is a partnership, for example, between the Audi auto brand at the national level and the individual Audi car dealers. It also happens in other industries, like the insurance industry), where the corporate marketing group will provide local insurance agents matching funds, media credits, and ad templates that promote both the national brand and the local agent to potential customers. Almost all coop advertising require the advertiser to specifically mention the manufacturer or parent company in the ad. Cooperative advertising is a cost-effective way for manufacturers, retailers or distributors to reach their target markets. Copy is the content, artwork or advertising displayed on an outdoor billboard unit or other out-of-home (OOH) structure. The quality of the ad’s creative design can impact the number of people who notice it. Copy area is the viewing area on an out-of-home or billboard unit or face that includes the copy, images and other content. Cost per day (CPD) is a time-based pricing method in which an advertiser buys ad impressions on a "time" basis. It refers to the amount an advertiser is willing to pay, per day, to have their ad run or displayed on a specific structure, billboard unit or site. Cost per rating point (CPGRP) is a measure of cost efficiency which enables you to compare the cost of an advertisement or campaign schedule to other advertisements (for example, TV, versus radio, or versus out-of-home (OOH) or billboard advertising). CPGRP is calculated as media cost divided by Gross Rating Points. The Cost per rating point (CPGRP) is the cost of advertising exposure opportunities that equals one rating point or one (1%) of the population in any geographically defined market. Also known as Cost Per Point. Cost-Per-Point (CPP) is a measure of cost efficiency which enables you to compare the cost of an advertisement or campaign schedule to other advertisements (for example, TV, versus radio, or versus out-of-home (OOH) or billboard advertising). CPP is calculated as Media Cost divided by Gross Rating Points. The Cost per point (CPP) is the cost of advertising exposure opportunities that equals one rating point or one (1%) of the population in any geographically defined market. Also known as Cost Per Gross Rating. Count station is a section of road with a specific traffic pattern. Count stations contain traffic estimates and the demographic composition of that traffic. All displays assigned to a count station start with same traffic count used to measure circulation levels. A display may have more than one count station based if it can be seen from more than on road. Coverage (also known as coverage area) represents the boundaries of a market exposed to an OOH or outdoor advertising campaign as defined by geographic parameters, expressed in DMAs, CBSA, groups of counties, or individual counties. Coverage can also be the percent of the population within any of these geographic areas that can be reached by the total outdoor advertising or billboard inventory of a media operator. Cost per flip (CPF) is the price paid by an advertiser to a digital out-of-home (OOH) or digital billboard owner to display or deliver a single ad on the OOH unit, billboard or structure. Fliphound tracks this information for advertisers using its RTB and fixed pricing package ad purchases. This is similar to the cost per click (CPC) measurement for online ads. Creative (also known as copy) is the content, artwork or advertising displayed on an outdoor billboard unit or other out-of-home (OOH) structure often developed by a graphic designer. The quality of the ad’s creative design can impact the number of people who notice it. Also see Copy. Creative brief (also known as design brief) is the foundation of any advertising or marketing campaign and provides background on the advertiser, details the advertisers marketing objective, describes the product or service being marketed, helps identify the target audience or target market, helps the creative and design understand what needs to be included in the ad and copy, has budget estimates, includes the company's logo or other creative materials, identifies the deliverables, and outlines a tentative campaign schedule. 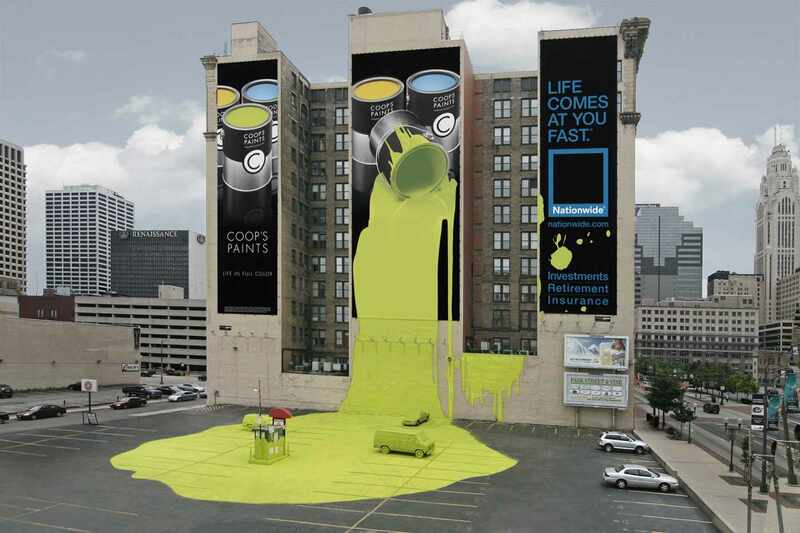 Click to access Fliphound's outdoor advertising and billboard design brief. Cross read (aka Left read) describes the position of the billboard face or advertising display as it relates to the direction of the motorist. When the traveler is going one direction, and the face is on the left side, ACROSS the road of travel, it is known in the industry as a cross read or left read. Alternately, one on the right side is a right read. C-store displays are point-of-purchase (POP) displays, typically the same format as transit shelter posters that are positioned at the entrance of convenience stores. Custom market is a marketing method whereby an advertiser tries to customize the message to the unique needs of a specific customer or specific subset of customers or specific portion of the market. Custom markets are used by billboard companies (or their billboard plants or networks) or advertisers to highlight out-of-home (OOH) ad delivery within relevant geographic areas. For example, custom markets are generally counties or groups of counties or a custom market that may use targeted outdoor billboard advertising to reach certain demographic profiles like a high net worth customers. Cut-outs (also known as embellishments) are any lettering, image, or mechanical device that extends beyond the standard face of a billboard to attract more attention. Cut-outs are only allowed in certain areas. See also Embellishment and Extension. Daily Effective Circulation (D.E.C.) is the average number of passers-by or persons (18+ years) in cars or other vehicles, that could potentially be exposed to an advertising display or billboard for either 12 hours (unilluminated – 6:00am to 6:00pm) or 18 hours (illuminated – 6:00am to 12:00 midnight) on an average day. Many billboard operators use actual traffic counts provided by State departments of transportation (or DOTs) since most people understand this well in given market areas. The equation to calculate Daily Effective Circulation for a particular billboard equals the number Adults (18+ yrs.) multiplied by the effective illumination rate of the display or billboard multiplied by the average passengers in a car or other vehicle. Deal ID, or deal identifier, is the unique number of an automated ad buy. A deal identifier (ID) is a unique string of characters or piece of code used by online programmatic ad platforms, public and private marketplace to match up specific buyers and sellers with advertising transactions based on a number of rules they have agreed on electronically or using automation previously. A deal identifier (ID) for Fliphound is the identifier that links the OOH or outdoor billboard advertising inventory (pricing, terms, duration frequency data, etc.) to a specific advertiser or media buyer. Deal ID’s are widely used on the web and internet to grant buyer/ATD/DSP access to ad placements or data that a publisher exclusively makes available to them. Demand side platform (DSP) is a company or ad platform that provides technology for media buyers to purchase ad placements, typically via guaranteed contracts, packages or real-time-bidding (RTB) on using an online platform. Fliphound is a leading player in the outdoor billboard and out-of-home industry. Leading players on the web are Google’s DoubleClick and Turn. Demographic profile is method to profile target advertising audiences based on characteristics such as ethnicity, age, gender, address, income, education what they buy, where they buy it, how they pay, etc. Sophisticated advertisers and brands can use this information to gain insight that will help them sell products to these target audiences. Demographic profiles are used to plan, buy and sell media. A designated market area or a DMA is a geographic area that represents specific television markets as defined by and updated annually by the Nielsen Company. A designated market area or DMA is used by advertisers for multi-media planning, DMAs are non-overlapping markets and cover the entire United States. Outdoor billboard advertisers use DMAs to geographically target advertising campaigns and DMA data to compare out-of-home advertising to other media. A desktop computer is a personal computer (also abbreviated PC) small enough to fit in one person's workspace. The majority of billboard owners and companies use desktop computers to list their inventory on Fliphound. Most of Fliphound advertisers use desktop or PC's to purchase their advertisements on Fliphound. 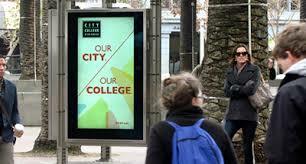 Digital Out-of-Home or DOOH refers to digital media used for advertising and marketing purposes outside of the home. This includes any out-of-home (OOH) display, digital billboard or digital signage that can change its advertising content remotely using addressable electronic, LED, and screen technology but excludes TV advertising and radio advertising. It does not include vinyl or static billboards, bus shelters or other static displays or panels. The term is sometimes hyphenated as digital-out-of-home or abbreviated as DOOH. The term digital out of home (DOOH) is often used in relation to advertising based networks but is also use for digital billboard networks. Digital out of home advertising place based networks can be found in many places including your local restaurant, a doctor’s office, or even on the top of gas pumps. Digital place based media are addressable, electronic, OOH screens that change advertising content remotely, excluding roadside digital OOH media such as billboards and bus shelters. Digital place-based media includes a broad range of content including static messages and full motion video with an audio track. Dimming is changing the brightness of a display, LED or digital billboard, or the capability of increasing or decreasing the overall display intensity. The brightness level should be highest during the day to compete with daylight, and lower at night. Display Period is the interval of time or exposure when an out-of-home (OOH) advertising campaign is run and viewed. Dissolve is a mode of message transition on an LED display accomplished by varying the light intensity or pattern, where the first message gradually appears to dissipate and lose legibility simultaneously with the gradual appearance and legibility of the second message. Distribution is the strategic placement of ads on out-of-home OOH units or billboards across a market. The distribution of units will impact the reach of the campaign and the demographic profile of the audience that is delivered. Dwell time (also known as read time) is the amount or interval of time, usually measured in seconds for minutes, an audience member spends viewing the outdoor advertising display or billboard. A digital billboard, for example, on a major roadway or highway may have a dwell time of 10-12 seconds. A digital LED billboard at an intersection would have a longer dwell or read time, often of 30-45 seconds, since the vehicle would have to wait for the light to change. A digital bus stop ad, for example, likely has a dwell time of somewhere between five (5) and fifteen (15) minutes, or as long as people typically wait for a bus. The longer the dwell or read time the more desirable the sign or outdoor billboard unit is to an advertiser. See also Read Time. Eco-Poster or Eco-Flex Vinyl are environmentally friendly, recyclable substrates (or vinyls) made from 100% polyethylene (PE) material that attach as a single sheet to a poster or bulletin structure. Effective reach represents the number of persons within the target audience exposed to an out-of-home or billboard advertising campaign or schedule an average of three or more times. Efficiency is the degree of value delivered to an outdoor advertising audience relative to the audience that is delivered and cost. Usually expressed as either CPM (cost per thousand) or CPP (cost per gross rating point). Embellishment (also known as cut-outs) happens in outdoor advertising when letters, figures, images, mechanical devices or lighting are attached to the face of an out-of-home (OOH) or outdoor advertising billboard unit to attract more attention or create a special effect. Certain outdoor advertising markets allow billboard embellishments and there are other markets that do not allow embellishments on outdoor advertising structures. See also Cut-out and Extension. Emerging media are recently developed or introduced outdoor formats. Expected lifetime is the anticipated length of use for an LED, digital billboard or sign. The expected lifetime of an LED or digital billboard or display is measured at the point when the sign has degraded to 50 percent of its original intensity. Digital billboards, digital displays and LEDs have a typical expected life of 50,000 to 100,000 hours (as specified by the manufacturer). Exposure is the measure of actual eye contact with and out-of-home (OOH) media unit or billboard structure. Exposure represents the reasonable opportunities for outdoor advertising to be seen and read. See also Noticing. Extensions (also known as top outs, cut outs, extenders, embellishments, etc.) are elements on a board that extend beyond the normal live (or copy) area of a billboard structure. They are used to extend design elements beyond the normal boundaries of the unit or basic restraints of a bulleting or poster. The uncommon shape and extra size works well to draw even more attention to the billboard ad. For example, Coca-Cola used ad extensions to promote Coke Zero by making a drinkable billboard ad with a straw that was capable of serving soda to NCCA Final Four Basketball fans via six fountain spouts. Eyes on Impressions (EOI) is a metric derived from Geopath (formerly TAB Audit Bureau or TAB) to provide a more accurate account of how many people look at an outdoor advertisement. Displayed as a weekly metric in hundreds of thousands. Also known as out-of-home (OOH) impressions or more simply OOH impressions. For example, eyes on impression or EOI of 456,780 means 456,780 people look at a particular billboard in a given week. Face is the surface area on an outdoor unit or structure where advertising copy is displayed. A face can also be referred to as a “panel” or “unit”. A billboard unit may have more than one face. Many are stacks (one face on top of the other) or back-to-backs (one face on the back side) allowing for multiple outdoor advertisers. Fade is a mode of message transition on an LED display accomplished by varying the light intensity, where the first message gradually reduces intensity to the point of not being legible and the subsequent message gradually increases intensity to the point of legibility. Finishing is the method used to hem the edges of posters and bulletins. Finishing can include welded pockets or other operational techniques for hanging substrates or vinyls onto billboard units. First look is a situation in which the media seller (e.g., billboard owner) gives certain buyers priority in access to inventory. For example, an outdoor billboard company is selling its remnant inventory to two of its top advertisers. In a first look situation, the media owner gives the first advertiser a chance to buy the inventory first. If that first advertiser does not want it, the media owner will pass it to the second advertiser and so on. A first time advertiser is a new paying advertiser that executes an advertising campaign on Fliphound. First party data is information that a company has collected directly, like a retailer’s list of loyalty members. The term fixed price is a phrase used to mean the price of a good or a service is not subject to bargaining. This is an agreement in which an ad buyer and seller determine a flat price or fixed price the buyer will pay for the inventory or deal. This is stated within the contract as in contrast to an auction environment where the highest bidder wins. On Fliphound, fixed pricing is used by outdoor advertisers to purchase fixed contract and package from its digital billboard inventory. Flagging is a tear that causes the vinyl, ad copay, production or poster paper to hang loose or detach from a bulletin, poster or Out of Home (OOH) face, typically due to natural elements (i.e. excessive wind or rain). These are also referred to as “blown” or “blow-ups” derived from our poster paper days. Flash ads are Adobe's rich media file format, which is used to display interactive animations on the Web. Depending on the ad's design, an entire Flash ad can be animated, or just part can be while the other remains static. Publishers usually limit the file size of a Flash ad and the number of times or length of time the animation can loop. Flight is the length of an advertising campaign, sometimes divided into distinct segments over the course of weeks. Fliphound is an online open and public ad platform that allows any size business or advertiser to access the largest online digital billboard network and leverage outdoor displays a part of their online advertising media mix. Fliphound has been operational since 2013 and has executed 1,000’s of campaigns for hundreds of paying customers. Fliphound is a trusted and transparent national online marketplace that includes almost 500 digital billboards in more than 25 states. Fliphound is a privately held company and is headquartered in Wichita, KS. Geo-Fencing refers to drawing a virtual barrier around a location (or billboard) using mobile device global positioning system (GPS) or computer Internet Protocol (IP) data and addresses, which is just like your virtual address. A Geofence can be a predefined set of boundaries, like a radius around an advertiser location (anywhere from a mile to state-wide), a billboard, or out of home (OOH) ad. Ads inside of geo-fenced areas can be seen on computer, tablet, or mobile devices as potential customers are when they access their phone or browse the web. Technically, geo-fencing can be any size radius from a particular location, anywhere from a mile to state-wide. But most people when they are referring to geo-fencing are looking for a very tight radius around a location. Geofenced advertising can activate or display mobile content or ads to the person inside the geo-fenced radius to alert them of a local deal or the distance you are from a particular store location. With geo-fencing outdoor advertisers have the opportunity to combine the impact of OOH at a specific location with precise mobile targeting at that same location to a variety of audiences. If you are interested in advertising to a population of all ages and all interests, geo-fencing is perfect for you. The Geopath (formerly known as TAB) ratings system was designed to provide OOH advertising with credible metrics comparable other measured media. This is achieved with a sophisticated research program specifically designed to measure audiences who actually see advertising on OOH ads throughout the country. The integrated research method implemented incorporates research and expertise in the areas of circulation, visibility and eye tracking research, demography and trip modeling, and the building of powerful reach and frequency models. Gross impressions are the sum of impressions delivered or registered by an out-of-home (OOH) or billboard advertising campaign against a target audience based on a GRP level of days or weeks in a schedule. Guaranteed Space is a term used by digital out-of-home (OOH) advertising network operators (sellers) to describe guaranteed ad placement. In order to secure guaranteed ad placement for a specific date, time and location, it is recommended you pay the network operators rate card asking price. Hand Painting is the placement of copy onto an out-of-home structure or piece of vinyl using an artist who actually paints the artwork onto a wallscape, outdoor advertising unit or the vinyl by hand. The outdoor advertising industry was started with handpainted billboards and the handpainting of billboards continued until the early 1970s. Recently hand painted billboards are making a comeback on wallscapes and other billboard structures. The Highway Beautification Act of 1965 is Federal legislation sometimes referred to as the Lady Bird Johnson Act. The act was signed into law by President Lyndon B. Johnson and mandates state controls regarding Out of Home (OOH) media and outdoor billboard advertising on interstate highways. Illuminated refers to an outdoor unit or billboard structure equipped with lighting that provides night time illumination of an advertising message, usually from dusk until midnight. Illuminated face or unit is an out-of-home (OOH) or outdoor structure equipped with lighting that provides nighttime illumination of an advertising message, usually from dusk until midnight. The impressions for an illuminated unit or billboard are calculated using an 18 or 24 hour viewing period. Image duration is the time the flip, message or ad plays on an outdoor advertising digital billboard measured in seconds (or minutes). Image durations can vary by market or structure. Outdoor advertising companies typically have image (ad or flip) durations ranging between six and eight (6-8) seconds. See also Flip. Impression, sometimes called a view or an ad view, is a term that refers to the point in which an ad is viewed once by a person, or displayed once on an outdoor unit or OOH display. The number of impressions of a particular advertisement is a term used to describe how many people have been exposed (or had the opportunity to be exposed) to your advertisement in a given period of time. For example, assume there is a room of five people watching a digital screen and your ad displays one time. Therefore, it had a total opportunity to have made 5 impressions. If your ad displays again, it will have had a total opportunity to have made 10 impressions. Unless specified as in-market, impressions include all persons who notice the ad unit, regardless of the origin of their trips. Impressions are reported in weekly increments. Also known as Eyes on Impressions (EOIs). Independent Billboard Operators Association (IBOUSA) is a professional organization that consists of like-minded regional billboard operators that function in a collective and cooperative manner. The IBOUSA’s main focus over the past several years has been to aggregate and make their existing members collective billboard inventory available to national accounts through an exclusive media agency relationship. In-market Impressions are the total number of times people passing an outdoor advertising or OOH display that live in a defined market (e.g. a DMA or CBSA), are likely to notice an ad on an OOH display. In-market impressions exclude impressions derived from people who travel into or through the market, but live outside of it. In-market impressions are the audience from which GRPs are calculated. Intensity is also referred to as brightness. The LED industry measures digital billboard, signage or display intensity in candelas per square meter, which is also referred to as nits. A junior poster is a standardized out-of-home (OOH) poster format measuring 6' x 12' in overall size with a distinctive frame around the ad face. Formerly known as an 8-sheet poster. LED brightness is the level of an LED, digital billboard or display measured in milli-candelas. The materials used to manufacture the LED determine the brightness of the LED. Also see Intensity. Life style or retail out-of-home (OOH) media that are used to create customized advertising programs that generally target specific consumer audiences. Lifestyle/Retail includes, but is not limited to: arena and stadiums, placed based, digital networks, health clubs/restaurants/bars, exterior placed based (i.e. airborne, marine, resorts and leisure). Likelihood to See (LTS) is the portion of the OTS (Opportunity to See) audience who are likely to see an outdoor ad. OOH is the first medium in the US to move from reporting OTS audiences (DECs) to LTS (Likely to See) audiences, which can also be referred to as commercial audiences. Line of sight is the area in which an out-of-Home (OOH) face is viewed. Line of sight is also the simultaneous viewing of more than one out-of-home unit or billboard. Standing at one billboard, all other billboards that can be seen from there are in the line of sight of that board. A location list (also known as inventory list) is a listing of all locations or out-of-home (OOH) or billboard inventory included in a specific outdoor advertising program. Mall displays are back-lit advertising structures located at strategic points in shopping malls; usually two or three-sided. A market is a geographically defined areas used to buy and sell media. Standard markets definitions are DMAs and CBSAs. Market ride (also known as Pre-ride or Post-ride) is the physical inspection of the outdoor advertising billboards, structures or units that comprise an out of home advertising (OOH) program in a market. Advertisers and agencies often conduct pre-buy (pre-ride) or post-buy (post-ride) market rides to determine which billboard locations are the best for their advertising campaigns. In most cases, local agencies know the coverage area and are able to choose the most effective billboard inventory for their clients. National advertisers and agencies who have conducted market rides locally have told us that the Atomic Billboard network contains the best large format billboards in the Wichita market. Markets are geographically defined areas used to buy and sell media. Standard markets definitions are DMAs and CBSAs. Out-of-home (OOH) media companies and advertisers also use custom geographies based on their geographic coverage of their billboard, display, panel or product sales distribution areas respectively. Max file size is the largest file size that the media owner will accept for the specific creative for the ad unit or display or billboard they've made available. Media cost is the price you pay display, run, or present your advertisement or campaign during a specified date range or campaign period. There are many different ways to price media including points, impressions, flips, clicks, leads, actions, days, weeks, months, etc. Media Cost excludes the cost to create the advertisement (copy or artwork) and other costs. Message duration (also known as Flip duration) is the interval of time when a digital OOH advertising message is viewed. 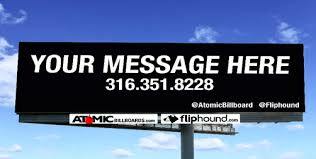 For example, most digital billboards play messages or flips every six to eight (6-8) seconds. Metrics is information or data that is either provided by the media owner or a third party in order to give advertising buyers more information about the market, its demographics or it individual structure or sign. The most basic metric information is provided on a one sheet that describes the billboard inventory, the demographics associated with the structure and also includes approach shot photographs. Some media owners and some programmatic partners require a minimum spend in order for an advertiser to purchase space or ad inventory on their platform or on a specific structure or billboard unit. For example, it may be that an advertiser must spend at least $500 on this specific ad display, which then results in a certain number of impressions depending on the CPM. Noticing is a physiological or behavioral measure of actual eye contact with an out of home (OOH) media unit and its advertising. For example, Geopath (formerly TAB) conducts visibility research that are derived from the adjustment of circulation or passing to those who notice the advertising on the sign or billboard. OAAA (Outdoor Advertising Association of America) is national trade association representing Out of Home (OOH) companies, suppliers and affiliates. The mission of the OAAA is to promote, protect and improve the outdoor advertising medium by focusing on legislation, marketing, product improvement, new technologies and industry unity. An OBIE Award is an annual award that recognizes creative excellence in Out of Home (OOH) and outdoor advertising. The OBIE Award program is administered by the OAAA. Official counts are the traffic counts taken from official (governmental) sources such as city, state or county departments of transportation. An off-premise sign is a sign displaying advertising copy that pertains to a business, person, organization, activity, event, place, service or product not principally located or primarily manufactured or sold on the premises on which the sign is located. 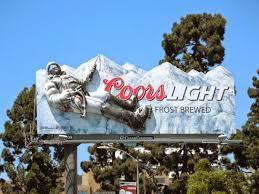 An out-of-home (OOH) display or billboard is an off-premise sign. Off-premise signs are subject to different and more stringent permitting rules. An on-premise sign is a free-standing sign that advertises products or services that are sold, produced, manufactured or furnished on the property where the sign is located. On-premise signs can also identify or advertise a business or person that maintains a business on the same premises. Most states and municipalities do not allow third party commercial advertising revenue to be generated from on-premise signs. Car dealers often install and use on-premise signs to promote their dealership, cars, promotions and services. An open ad exchange (also known as open marketplace) is an ad buying and selling environment in which the media allows buyers to access their inventory. Media owners choose to participate in these platform to gain access to new customers or sell unsold inventory (also known as remnant space or inventory). Fliphound is a pioneer in automating ad buying and selling for digital billboards and works with billboard companies and networks to help them enable online selling and access internet advertisers. With Fliphound, unlike many of the internet ad exchanges the media and billboard owners maintain rights to accept and approve advertisers and content that is displayed on their out-of-home networks. Opportunity to See (OTS) is a basic measure of media exposure. OTS estimates are measures of media exposure (e.g. magazine readership or the TV program exposures) and not the advertising. Ordinal directions refer to the direction found at the point equally between each cardinal direction. Ordinal directions are: northeast (NE), southeast (SE), southwest (SW), and northwest (NW). Ordinal directions are also known as intercardinal directions. Out of Home (OOH) Video Network are place-based video networks that offer editorial content and video advertising. They are include and are often located in-store, elevators, pharmacies, bars, health clubs and other venues. Outdoor is the term refers to any form of media that carries advertising messages to consumer audiences outside the home. Outdoor advertising or out of home products are divided among four primary categories: billboards, street furniture, transit and alternative media. Outdoor media is term primarily associated with billboards, street furniture, transit and alternative media and refers to any form of media that carries advertising messages to consumer audiences outside the home. Out-of-home (OOH) companies or operators provide outdoor advertising services and products to advertisers and brands looking to promote products and services or reach targeted audiences. Approximately 100 of the 12,000 ad agencies are OOH specialists -companies on the larger end include Mediavest and OMD/OMG and on the smaller end include Billups and Grand Design. There are approximately 2,000 OOH billboard companies and 100's of other DOOH network operators - the largest companies are Lamar, Outfront Media, and Clear Channel Outdoor and on the smaller end include companies like Atomic Billboards and O2 Media. An override is the continuation of an outdoor advertising campaign or program beyond a contracted period. An override, if offered by an outdoor advertising company, is provided at no additional cost to an advertiser. Pedestrian Daily Effective Circulation (PDEC) is the total number of pedestrians passing and potentially exposed to an outdoor advertising display for either 12 hours (un-illuminated; 6:00am to 6:00pm), 18 hours (illuminated; 6:00am to Midnight), or 24 hours. Pedestrian Daily Effective Circulation (PDEC) remain a valuable measure of circulation for the out-of-home (OOH) industry and is most relevant in metro markets. Percent composition is the percent of the total audience for an outdoor display or schedule that a brand target demographic group comprise (e.g. 65% of the total impressions for Adults 18+ were Men 24-64). A permanent bulletin is a bulletin ad, used in an outdoor advertising campaign, where the advertising remains permanently located at a specified billboard or structure site throughout the term of a contract, usually for long periods (12 months or longer). A permanent bulletin program can build strong brand recognition in specific market areas so customers will think of you when making purchasing decisions. Permanent billboard bulletins, usually available in high density locations, often point motorists and travelers to the nearest exit for restaurants, lodging and fuel. Many bulletin locations may be marked as “Permanent” units, meaning they are sold for longer flights and not included in a market’s list of locations available for "Rotary" of "Flighting" ad campaigns or programs. Phone kiosk is a structure that houses public telephones and offers outdoor advertising displays. A pixel (a word invented from "picture element") is the basic unit of programmable color on a digital or computer display. Pixels, short for picture elements, are points of light that illuminate to form letters, words, graphics, animations and video images and can be turned on (illuminated or off (darkened). A pixel can be made up of a single LED, multiple LEDs of the same color or multiple LEDs of different colors. They are the smallest elements of the electronics display system that can be individually controlled and turned off or on at various brightness levels. New digital billboard investment by land owners and billboard owners is capitalizing on decreasing LED pricing and innovations in digital technology especially improvements related to pixel density. Pixel density or display resolution is function of the number of individual pixels present on the face of a digital billboard - a significant factor in determining image quality. Out-of-home (OOH) advertisers continue to be attracted to high quality LED digital billboard structures. The more pixels in a given area (1 red LED, 1 green LED, 1 blue LED - no sharing), the higher the pixel density and image quality and therefore the better the revenue opportunity for the billboard owner or operator. Place based media (also known as digital play space media) is outdoor or OOH media used to create customized advertising programs generally targeting specific consumer audiences. Place-based media is generally used by outdoor advertisers who are looking to target audiences in advertising in: arenas and stadiums, retail video retail networks, health clubs and gym, bar and restaurants, and movie theaters. Plant (also known as billboard or OOH plant) is the physical plant installed and owned by a billboard company or operator. The term is used to describe all of the out-of-home (OOH) units or billboard inventory owned or managed by the operator in a given market. Sometimes the term refers to the company itself. Plant defined market is a custom market defined by a plant usually established based on the geographic coverage of its inventory. Polyethylene (PE) is a widely used plastic thermoplastic polymer (or vinyl) consisting of long chains of monomer ethylene. It is used to make single sheet posters or other billboard substrates and is recyclable. Polypropylene (PP) is a widely used thermoplastic polymer with an intermediate level of crystallinity between that of low-density and high-density polyethylene. It is used to make single sheet posters or other billboard substrates and is recyclable. Polyvinyl Chloride (PVC) is a thermoplastic polymer constructed of repeating vinyl groups or ethenyls having one of their hydrogens replaced with a chloride group. The vinyl is commonly used as an advertising substrate for bulletins and some poster products. Population is the total number of people who live within a market. The population can be segmented by key demographic groups. Populations (also referred to as universe estimates) of defined geographic areas are the bases from which rating points are calculated. Outdoor advertisers use population metrics and data to target different audiences. A poster is a standard out-of-home poster format distinguished by its size and frame around the production/copy. A poster (previously referred to as a 30-Sheet) typically measures 12'3” x 24’6” and Junior Poster (previously referred to as an 8-Sheet) measures 6' x 12'. Posters are located chiefly in commercial and industrial areas on major local roads. They are viewed principally by people in automobiles or pedestrians and deliver exposure to residents and to commuter traffic. Posters can be found in virtually all markets (cities/towns). Posters allow out-of-home advertisers to: build reach within a market quickly and cost effectively, are ideal for localized targeting of demographic audiences and geographic areas; and stimulate sales near point-of-purchase locations. A poster panel is an outdoor unit that can accommodate 30-sheet or 8-sheet poster displays. Posting date is the date when an out-of-home (OOH) program or outdoor advertising campaign is scheduled to commence. A 5-day leeway is customary for posting dates. Posting instructions are detailed directions provided to an outdoor advertising or OOH billboard company by an advertiser or agency assigning specific copy to specific locations to be displayed according to the terms of the campaign contract. Posting period (also known as display period) is the time the ad or flip or message rand on the outdoor advertising structure. For traditional static or vinyl outdoor advertising structures this is usually measured in months, since substrate needs to be installed or hung on the outdoor unit. Digital outdoor billboard advertising now allows posting periods to be much shorter (measured in days or weeks) since the ad copy or artwork can be sent electronically to the digital billboard face via a computer or other device. Posting window is a window of five working days after a scheduled posting date in which all outdoor or OOH advertising contracted for certain locations or billboards can be posted without penalty. A premiere panel is standardized out-of-home (OOH) display format measuring 12' 3" wide x 24'6" high in overall size. The premiere panel offer the impact of a bulletin by utilizing a single vinyl face stretched over a standard 30-sheet poster panel. Premiere panels are located in high volume commuter neighborhoods and major commercial or retail centers and can be found in in virtually all markets (cities/towns). Premiere panels allow outdoor advertisers to: develop visually striking, ads for long term positioning in desirable areas of a market; enhances their brand and image in the marketplace; deliver high reach and frequency over an extended period of time and when available use extensions and unique embellishments for additional impact. 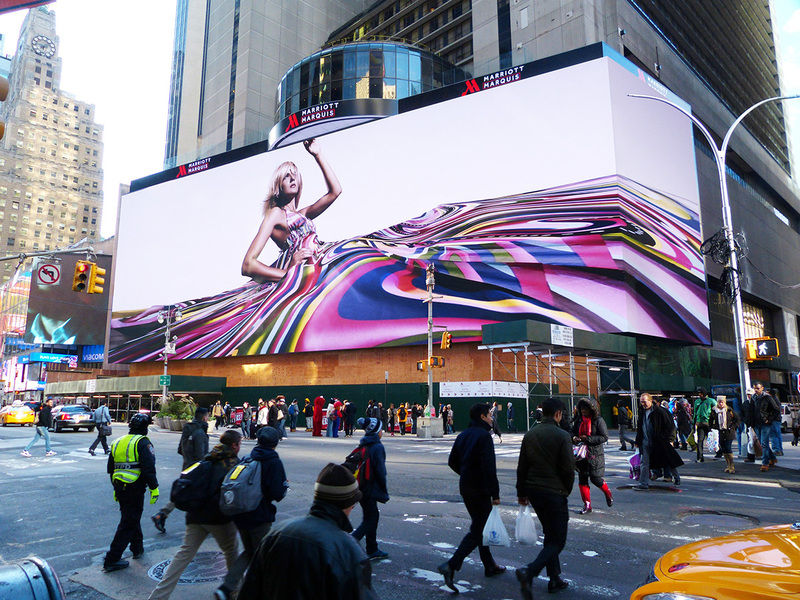 A premiere square is standardized out-of-home (OOH) display format measuring 25'5” wide x 24'6” high in overall size. The premiere square utilizes a single sheet vinyl face stretched over two stacked poster panels. In some markets, this same technique can be applied to stacked junior poster panels typically measuring 12’ 6"x 12’ 1" in overall size. Premiere squares are located chiefly in high trafficked commercial and industrial areas on major local roads in virtually all markets (cities/towns). They are viewed principally by people in automobiles or pedestrians and deliver exposure to residents and to commuter traffic. Premiere squares allow outdoor advertisers to: utilize highly visible and impactful displays, deliver high reach and frequency over an extended period of time and when available use extensions and unique embellishments for additional impact. Premium inventory is out-of-home media ad space or inventory that a billboard company or operator has deemed higher-quality based on a number of factors and subsequently attempts to sell it at a higher price. Premium inventory is labeled premium because it attracts the best and highest paying outdoor advertisers and is located: in the highest trafficked areas, in the most desirable neighborhoods, or on the best streets or arteries or corridors. This inventory is often locked up by advertisers and is rarely discounted. For example, a billboard operator, like Atomic Billboards, owns and manages all the only large format digital billboards in the highly travelled auto and car dealer row in Wichita Kansas. Printed OOH media any OOH display or outdoor ad that uses a printed substrate to display advertising content. Private Marketplace (aka private auction, private exchange, closed auction) is a type of programmatic advertising. It refers to a closed real-time-bidding (RTB), invitation-only, auction environment for digital advertising that leverages the media owner's ad inventory, typically to a select number of advertisers. Inventory is bought and sold at an impression or price level and it is a one-on-one deal between media owner and buyer, facilitated through a private marketplace such as Criterio or Rubicon Project. It also allows media owners to monetize their remnant inventory and place rules around who can purchase impressions. Programmatic advertising refers to the automation of buying and selling digital media. Advertisers use programmatic technology to more efficiently buy or bid on digital ad inventory, with less (and sometimes no) direct communication with people. It reduces much of the manual back and forth that come with the middle steps of buying and selling, including IOs. Fliphound is one of the leaders in online and programmatic buying and selling for the out-of-home (OOH) and digital billboard industry. A programmatic direct buy ad buy is one done directly between a media owner (publisher) and advertiser through automated ad-buying systems. The typical automated ad buy. It’s similar to an open auction in which relatively anyone can bid to buy ad space that’s up for sale. An automated ad buy that’s only open to a specified set of advertisers. Proof-of-Performance (POPs) are certifications sent to advertisers by an outdoor company that contracted advertising services has been rendered. Proof-of-Performance (POPs) reports typically include the vendor name, structure number, advertiser name, flight dates, products advertised, summary of message played, times message played and photos of the ad being played on the specific billboard structure. Automated platforms, like Fliphound, allow advertisers to access proof of performance electronic logs that show details about when, where and what time the ad was played. Many large agencies and national advertisers require proof of performance reports with photos as part of the contract and to be done in advance of payment. A rate card is a document containing prices, terms, and descriptions for the various ad placement options available from a media owner or outlet. Similar to an MSRP rate on a car or the rack rate at a hotel, this is generally the maximum price that one may pay. In outdoor billboard advertising this is the maximum price an advertiser will pay for a guaranteed ad placement..
Reach is the approximate percentage of a target audience’s population which will be potentially exposed to an out-of-home (OOH) or outdoor billboard advertising message or ad at least once during a specified period of time. Reach is normally measured over four week campaign period. Read is the side of the face the billboard or outdoor advertisement appears in relation to the motorist passing by the advertisement or copy. The right-hand read is the side of the outdoor advertising sign or structure that is seen on the right-hand side of the street, while the left-hand read is the side of the sign that is always seen on the other side of the road, beyond the lane carrying traffic the other direction. See also Right Hand Read, Left Hand Read, Cross Read, and Read Time. Read time (also known as dwell time) is the amount or interval of time, usually measured in seconds for minutes, an audience member spends viewing the outdoor advertising display or billboard. A digital billboard, for example, on a major roadway or highway may have a read time of 10-12 seconds while travelling at the speed limit. A digital LED billboard at an intersection would have a longer dwell or read time, often of 30-45 seconds, since the vehicle would have to wait for the light to change. A digital bus stop ad, for example, likely has a read time of somewhere between five (5) and fifteen (15) minutes, or as long as people typically wait for a bus. The longer the dwell or read time the more desirable the sign or outdoor billboard unit is to an advertiser. See also Dwell Time. Real-time bidding (RTB) is an automated auction process for the purchase of individual ads or impression on different forms of media. Real-time-bidding (RTB) is form of programmatic buying where display ad inventory is bought by agencies/advertisers and sold by media, web site, and outdoor billboard owners through an online media exchange with auction pricing in real time. Web based programmatic, RTB platforms and automated ad exchanges are widely used and adopted by web and internet advertisers whose businesses are already online. The outdoor advertising industry has been slow to adopt these emerging technologies since most networks remain off-line and the larger operators are building their own private exchange solutions. Fliphound processed its first real-time-bidding campaign in 2013 and works closely with leading independent operators to enable their inventory for online buying and provide billboard operators access to online advertisers. The real-time-bidding (RTB) rate is the cost per flip or individual advertising message on an outdoor billboard or outdoor advertising unit. Real-time-bidding (RTB) pricing can vary based on the number of messages ,auction pricing demand, the unit or board chosen, and message length generally 8,7, or 6 seconds. The average monthly real-time-bidding (RTB) rate is calculated by taking the price paid for the ad campaign divided by the number of messages displayed (an 8 second ad rotation would equal 1,350 messages per day) divided by the number of days in a month (28 days are considered the standard days in a month for outdoor advertising). In Wichita, Kansas, for example, the average monthly RTB rate for ads purchased on Fliphound range between $0.025 and $0.09 per flip or ad. In the surrounding New York City tri-state metro area (CT-NJ-NY - not including Manhattan and Times Square) area average monthly RTB rates can range between $0.07 and $0.15 per flip or message. Recency theory is the idea or concept that advertising including out-of-home (OOH) me ssages sell to those consumers who are ready to buy. Refresh rate is the number of times per second the screen is updated or "repainted." Depending on the video standard, the actual image is changed only 30 times per second for NTSC signal or 25 times per second for PAL. However, most out-of-home LED systems use pulse-width modulation to generate the color levels, and if the image were only "painted" once for every change, there would be a noticeable flicker on the display. A refresh rate of greater than 60 times per second will minimize the flicker. In general, outdoor LED billboard displays should be refreshed at 120 times per second (120 Hz) or greater. Remainder advertising (also known as remnant advertising or last minute advertising) refers to the advertising space that a media or out-of-home company has been unable to sell. Remnant or last minute advertising is rarely discussed in outdoor advertising since few operators ever want to admit they have it, but everyone has it. Remnant space or inventory is typically available for three reasons: 1) it does not sell; 2) last minute cancellations; or 3) in periods of advertising industry softness or times when not everything is going to sell. The availability of remnant space is erratic and unpredictable but when an advertiser can find it - it often presents a great outdoor advertising opportunity if you can move quickly and are flexible. A significant amount of remnant space is now available through programmatic ad auction platforms in most mediums. Outdoor advertising has taken longer to adopt technology so the industry is moving into this space slowly. Keep in mind that often remnant ad space buys are pre-emptable meaning advertises can be bumped off if the operator sells a fixed contract. Fliphound is pioneering online buying for the outdoor ad and OOH industry and helps operators sell premium inventory and remnant inventory when it is available. Repetition is the average number of times each person is exposed to an outdoor advertisement. Also known as "Frequency". Reserve Price (also known as Minimum Price) is the absolute lowest price accepted by a outdoor advertising media owner for advertising placement is known as the Reserve Price or Minimum Price. Billboard owners can set minimum pricing per Flip, per day, per week, per 2 week and per 4 week periods in Fliphound. Retargeting is showing an ad to a person who visited your web site while that person is visiting another site. For example, a person checks out a pair of shoes on Amazon, and then sees an ad for those same shoes on Yahoo.com. A right read (also known as right hand read) is the side of the out-of-home (OOH) sign that is seen on the right-hand side of the street, while the left-hand read (also known as cross read) is the side that is always seen on the other side of the road, beyond the lane carrying traffic the other direction. In almost all cases, the right-hand read of a billboard or outdoor advertising sign is considered the more desirable side. Rotary bulletin is a standardized 14' x 48' bulletin that is moved to different locations in a market at fixed intervals, usually every 60 or 90 days. A rotary bulletin advertising program can provide balanced reach in a market. Rotary program is the movement of an advertiser’s message from one location to another at fixed intervals in order to achieve greater reach within the market. Also known as Flighting. Screen (also known as display or sign) is an out of home (OOH) advertising display capable of rendering digital content. Set back is the distance that an out of home structure or billboard is located from the area where traffic flows (or road). The more setback a billboard or structure is, the farther from the road the billboard is located. Shipping instructions is the information provided to printers for shipping billboard production to Out of Home (OOH) companies for posting. Shipping instructions should include a description of the design(s), full snipe text (if applicable), the number of faces shipped, and the contact with full address of each location where the materials are being shipped. Showing is the level of delivery or number of panel or signs required to reach a set percentage of the population of the market. Typical showing levels are: #100, #75, #50 and #25 showings. This means that with a #50 show, that 50% of the message will be presented to half the total viewers in the market. The number of outdoor advertising panels required in an actual showing varies by market depending on the total market population and the average DEC of the market’s inventory. This was the traditional way of selling out-of-home media and is now translated in to weekly levels of actual audience delivery in a standard media market. A sign (also known as a display) is any structure used to display information regarding a product or service. An Out of Home (OOH) face, unit or billboard is a sign. Single sheet poster is a poster constructed as a single and continuous substrate. Single sheet posters are typical make from thermoplastic polymers. Single sheet posters can be recycled. A snipe is an adhesive strip that is used to update, change, correct or cover a portion of copy or area on an existing out-of-home (OOH) face or billboard advertisement. Snipes are typically printed on a sticky back material called self-adhesive. The protective backing is removed on location and the snipe is applied to the unit or structure’s advertisement like a giant sticker. Space available bonus (also known as "Remnant" space), is a term used by digital out-of-home (OOH) advertising network operators (sellers) to describe un-sold advertising inventory. In the event that advertising space is still available before the start of any given time period, sellers are usually willing to accept a discounted rate vs. letting the space go un-sold. Sometimes, sellers will accept space available bonus contracts in advance, but if another advertiser (buyer) is willing to pay a higher price for the advertising space in question, the space available bonus buyer will get bumped. A spectacular billboard is a bulletin or out-of-home display usually larger than a 14’x48’ bulletin and is position in a prime location in a market. Spectacular billboards are grand in size and unique in scope and execution and appeal to a special group of advertisers. Spectacular billboards are typically located on highways or in dense commercial areas such as Times Square, Las Vegas, Atlantic City, and the Sunset Strip and often include special embellishments such as special lights, 3-D capabilities, etc. In 2014, Daktronics, Inc. installed the largest, most technically advanced spectacular billboard in the world for Clear Channel Outdoor in New York City that provides more than 25,000 square feet of advertising place. At the time of install, Clear Channel’s rate card was $2.5 million for a 4 week advertising campaign. A standardized face or unit is a structure that is constructed in accordance with the specifications established by the OAAA. Start date is the date when a campaign is scheduled to commence. Traditional static billboard advertising requires a few days leeway due to the timing and production of vinyl and substrates and required time to hang the vinyl. Digital billboard advertising is much more flexible since copy and images can be sent electronically to the structure or digital display. Street furniture is a collective term for objects and pieces of equipment, including benches, transit shelters, newstands/news racks, kiosks, urban or city panels, for common and public services that are installed along streets and roads for various purposes and can be used for street furniture out of home advertising. Street Side (or Line) is the side of a highway or street on which an Out of Home face or structure is positioned. Substrate is a wide variety of material used to produce OOH displays. Billboard substrates are typically made from thermoplastic polymers or PVC. Many street furniture and transit substrates are made from Fasson, paper, or film, among other materials. An ad-tech company that works with media owners or publishers to help them sell their inventory to new advertisers for the most money possible. http://localhost/outdoor-billboar. Fliphound is one of the leading players in providing this capability to out-of-home companies and helps sell advertising inventory for leading billboard owners and operators. The market is more developed for online advertising and the top players include AppNexus and Rubicon Project. Surface arterials are major streets in towns or cities that carry a heavy flow of vehicular traffic and represent significant target audiences and opportunities for OOH and outdoor advertising. Target Rating Points (TRPs) are a refinement of gross rating points, or GRPs. GRPs relate to the "total audience" exposure to advertising messages, whereas TRPs relate to the "target audience" exposure. Target Rating Points (TRPs), in the case of outdoor billboard advertising, equal the total number of in-market impressions from a target audience delivered by an outdoor or an out of home advertising campaign expressed as a percentage of a market population. Below is a simple example of how to calculate GRPs and TRPs. Each GRP equals 1 percent of the total audience; a TRP equals 1 percent of the target audience. If 40 percent of total target outdoor advertising households saw your ad one time that would translate into 40 GRPs. If your target audience was 50 percent of the total audience, that would translate into 20 TRPs. GRPs and TRPs are cumulative. Assume that your ad aired five times over a one week period and delivered the following TRPs per airing: 35, 40, 45, 43, and 37. The total delivery would be 200 TRPs. However, 200 TRPs can also be obtained with a 50 percent reach with a 4 frequency, or a 4 percent reach with a 50 frequency. Thus, GRPs and TRPs inform about the quantity of media weights, but not the quality of the weights. Targeting options are the specific targeting selections a media owner has made available for this specific ad unit. Each media or billboard owner determines their targeting options so they will vary. Examples for outdoor advertising include geographic targeting (by country, state, zip code or DMA), browser targeting as well as some custom targeting. Third party data is information that a company collects indirectly (such as through cookies) or aggregates from others (such as credit card companies and magazine publishers) and then sells to outdoor ad buyers to assist in audience targeting. To and through audience is a portion of the total impressions for an outdoor billboard display that is comprised of people who do not live in the neighborhood but travel past the unit. The demographic characteristics of the to and through audience can be significantly different from those of people who live in the surrounding neighborhood. The top out-of-home spenders by industry or product category are the top advertisers who regularly depend on outdoor advertising to grow their businesses and promote their brands, products and services. New and potential outdoor advertisers can see how leading companies and brands are using outdoor advertising to engage and reach target audiences and consumers. See Fliphound Industry Categories to see Megabrands research top 100 OOH advertisers and top outdoor advertisers by industry or product category. Traffic audit is a third party’s verification of traffic circulation in a market. Traffic audit information is used to calculate outdoor or out of home advertising daily effective circulation (DEC) and impression measurements. Traffic audit information is provided by each state’s department of transportation and from Geopath (formerly known as the Traffic Audit Bureau - TAB). For example, Atomic Billboards obtains traffic circulation information from the Kansas Department of Transportation (KDOT). A traffic count is a recording or count of vehicular or pedestrian traffic passing a given point along a particular road, highway, and path or intersection. In out-of-home advertising this is done to authenticate the traffic circulation that passes outdoor advertising structures or billboards to determine impression data or to verify who was exposed to outdoor ads. This data is collected and used by billboard companies and other companies, like Geopath (formerly TAB), to provide measurement data to outdoor advertisers. Traffic flow is a graphic presentation of the traffic volume or vehicular congestion along any system of streets, arteries or highways. Registered advertising users on Fliphound can see color coded traffic flow volumes (using GPS and other third party data) by market and specific billboard units in real-time and can use this information to choose the most effective and appropriate structures for their out-of-home advertising campaigns. Traffic origin is the place or point where vehicular or pedestrian traffic originates. Traffic origin information is used in combination with other traffic data (including traffic destination information) to provide advertisers with information about the audience passing outdoor advertising structures, not just those in immediate vicinity of the individual location. For example, collected license plate and GPS data can be correlated with residence data and demographics to pinpoint the origin and destinations of persons having potential exposure to outdoor advertising and specific structures. Transit are private or public transportation vehicles such as buses, subways, taxis, mobile trucks, and trains or the area in the common areas of transit terminals and stations. The high volume of passenger traffic using these transportation modes provides appealing locations and opportunities for out-of-home (OOH) media transit advertising. A transit display is an outdoor advertising unit affixed to moving public transportation vehicles or in the common areas of transit terminals and stations. Transit displays often help people find nearby transit options, news, commuting information and include OOH and outdoor ads. Transit displays include, but are not limited to: bus panels, train/rail panels, airport panels, taxi panels and mobile advertising signage. Transit posters are outdoor advertisements displayed in commuter rail stations and on trains. A transit shelter is curbside structure located at regular stopping points along urban bus routes. Transit shelter advertising affixes displays these curbside structures located at regular stopping points along a market's bus routes. The out of home ad displays are framed glass showcases that are typically backlit and measure approximately 69" high x 48" wide. In larger cities some of these are digital poster displays. Transition is the visual effect used on an LED display or digital billboard to change from one message to another. Tri-color chip is a discrete LED package containing the three colors (RGB) forming one pixel. Trim size are the dimensions of an outdoor advertisement substrate once it has been prepared for placement onto an OOH or billboard unit. A Trivision is an outdoor billboard sign that consists of triangular prisms, also called slated faces, placed inside a frame. The prisms rotate 120⁰ at intermittent intervals, each showing a new message of advertisement. As implied, three individual images, or messages, can be displayed on a Trivision which is also known as a three-message out of home advertising sign. In many cases, Trivison mechanical billboards are being replaced by digital billboards which allow operators to generate revenue from six to eight (6-8) advertisers instead of just 3. Unilluminated unit or face is an outdoor billboard structure that has not been equipped with lighting for nighttime illumination of an outdor advertising message. The impressions for an un-illuminated static billboard unit are calculated using a 12 hour viewing period, for example. Unique-user (device ID) is an identifier assigned to a user or device that lasts until the account is deleted or the device is reset. For example, Fliphound creates a unique advertiser specific user ID (or device ID) that is tied to each account on its online outdoor advertising platform and network. Fliphound also creates a unique billboard owner specific user ID (or device ID) that is tied to each billboard operators (media owners) account that displays ad inventory on its outdoor advertising platform. Online advertising companies like Google, Apple and Facebook also provide similar unique-user IDs tied to each account on their networks. Any outdoor or out of home advertising display or structure. The unit of measure for outdoor billboards is Daily Effective Circulation (DEC). This number represents the number of vehicles that pass by the billboard as well as the number of pedestrians. Unreserved inventory (also known as remnant ad inventory or remnant space) is ad space on a digital signage network, billboard or other out-of-home format that has not been sold. It is rare for any out-of-home media operator’s inventory to be 100% occupied at any given time, the available unsold inventory varies by operator (or network), market, format and time of the year. Fortunately for the out-of-home (OOH) industry capacity is limited due to scarcity of sign and billboard assets, permitting rules and legal regulations. On the web where ad capacity is expanding rapidly and inventory appears to be unlimited, this unsold this inventory is purchased through automated ad platforms within private marketplaces and RTB exchanges. The outdoor industry has been slow to adopt technology but pioneers, like Fliphound with the first, largest, open and public digital billboard network, are helping digital billboard owners tap into new advertisers and revenue. Ultra-violet cured coatings are applied over inks printed onto advertising substrates and dried by exposure to UV radiation. UV coatings are used to prevent color fading on out of home advertisements from sun exposure or other ambient lighting sources. Viewing area is the entire area of the outdoor advertising poster, display, or structure that can be viewed after display is live on a digital billboard or the poster or vinyl has been installed. Vinyl is a single-sheet substrate on which an outdoor advertising message is rendered by computer production. Vinyl is primarily used on the face of static bulletins, posters & premiere products. Visibility Adjustment Index (VAIs) ratio or the percentage of a unit’s total Opportunity to See (OTS) audience (circulation) who are likely to notice an outdoor ad. VAI’s are derived from Geopath’s visibility study. The impact of common board characteristics, size, road side, distance from the road, road type, and illumination are taken into consideration. VAIs are not measures of audience. Waiting list is list where an advertiser can place themselves next in line for an outdoor advertising billboard or other display that is currently unavailable. This generally happens on static or traditional billboards that allow only one advertiser and can be purchased and renewed for multiple years. Wavelenth is the distance in a periodic wave between two points of corresponding phases. The LED's wavelength determines its color on digital billboards.